New Year’s Day cards, all but unknown today, were at one time quite a popular item. The Streets of Salem blog features several New Year’s Day cards from the beginning of the 20th century up through the beginning of World War I. The one above caught my attention immediately because I didn’t immediately recognize its significance. 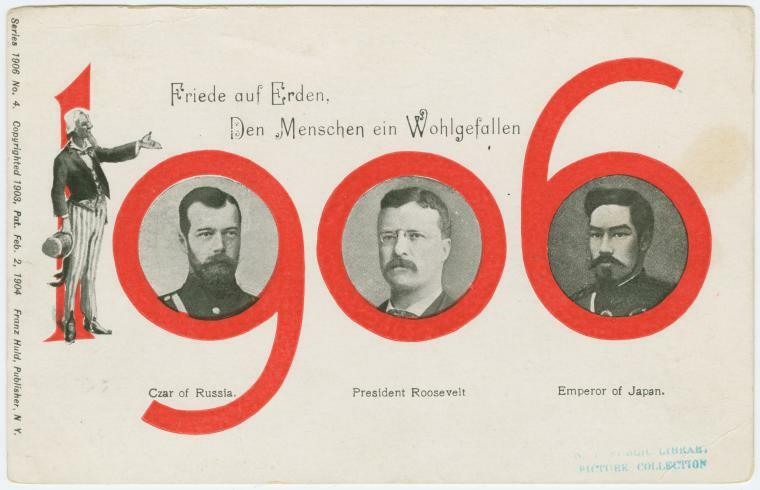 The Czar of Russia, the Emperor of Japan and President Theodore Roosevelt were all interesting individuals, to be certain, but why would someone think to make a New Year’s Day card featuring the trio, particularly given that pigs, pixies and shamrocks were more typical fare for such missives? Then it occurred to me what all three had in common, and why Roosevelt was in the middle: Teddy had toward the end of 1905 helped negotiate an end to the Russo-Japanese War. The conflict lasted from February 1904 until September 1905 and is considered the “first great war of the 20th century,” even if it’s a largely forgotten war today. On the utterly remote chance that you’re a resident of the Pacific island nation of Samoa, your birthday falls on Dec. 30 and you’re reading this blog, congratulations are in order: you’ve realized the dream of many a baby boomer by postponing the aging process. 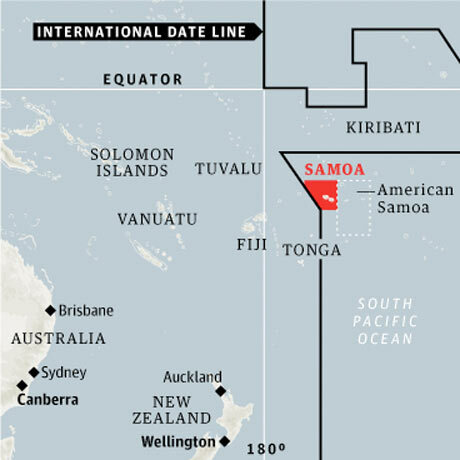 That’s because Samoa is eliminating Dec. 30 from its calendar for this one year as it switches time zones and jumps across the international date line. As a result, Samoa went from 11:59 p.m. on Dec. 29 to 12 a.m. on Dec. 31. The move, which takes Samoa from being one of the last places on earth to see the sun each day to being among the first, will enable the nation of 179,000 to be closer to its major trading partners in Australasia, according to Agence France-Presse. “In doing business with New Zealand and Australia, we’re losing out on two working days a week,” Prime Minister Tuilaepa Sailele Malielegaoi said, explaining the change. Gina Williams, a native Texan writing at the always-captivating Like the Dew website, details common misconceptions some Northerners have about people from the South. Williams does a good job debunking these myths, including providing a USA Today map of the 2004 presidential election which showed interestingly that plenty of Southern counties voted for Democratic candidate John Kerry over Republican George Bush, while there were several Northern states with a majority of counties favoring Bush over Kerry. The history books we grew up studying in school failed in one big respect: The American Civil War was not simply over the preservation of slavery; it was a war over states’ rights and excessive taxation. The simple fact is that, at the time, there was controversy on just how much involvement the federal government should have in state governments (sound familiar to current times? ); the federal government’s involvement with the anti-slavery movement set many Southern states off because they felt that state governments, through citizen voting, should determine laws on such things. And with increasing pressure by Northern states in the late 1850s to increase taxes to benefit their industries, Southerners became upset. Before and after those taxes were implemented with Abraham Lincoln’s entry into office, Southern states began seceding. Yow! Williams is right on the money here, but I wouldn’t dare trying pursuing this argument with anyone but my closest friends, whether they’re from the North or the South. Public school education dropped the ball on complex issues like the War Between the States a long, long time ago and I’m not stupid enough to try to pick it up. Imagine finding a dust-covered bankers box full of proclamations, bills and treaties signed by a multitude of American presidents, from George Washington and Thomas Jefferson to Franklin Roosevelt and Ronald Reagan. That’s essentially what happened recently in Poland, except on a much older scale. 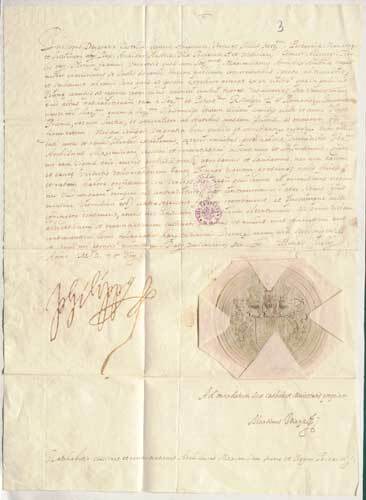 A collection of documents signed by a series of Polish monarchs, some more than 450 years old, turned up unexpectedly at the Warsaw School of Economics. Zoran Karisic, an archivist at the university library, found the documents by chance in a storeroom, according to Polskie Radio, Poland’s national publicly funded radio broadcasting organization. “It was a simple cardboard box, lined with paper and tied with string,” she told the Rzeczpospolita daily. The papers range from as far back as 1555 up through 1790, and include items signed by Bona Sforza (1494-1557), the Renaissance queen reputed to have had a habit of poisoning her enemies, including her daughter-in-law. It’s been a tried and true media strategy for years now: publications looking to stagger through the holidays while employees inconveniently take vacation get to the end of the year by slapping together a list or two. Whether it’s ranking the Top 10 Ugliest Dictators, the 15 Countries Most Likely to Harvest Your Organs when You Pass Out Drunk, or the 25 Most Powerful Monster Trucks Ever Built, lists not only demonstrate that Americans love short, easily digestible pieces that are basically devoid of information, but they fill white space quickly with little effort. So, in the spirit of general laziness, this blog has decided to join the fray. Top 10 largest fish I caught in 2011 (this, sadly, would largely be a wish list). A list, however, that I can manage is one that details my favorite books of 2011, along with a look at a few that weren’t quite so endearing. How dedicated are the researchers at Rome’s Institute of the Pathology of the Book, a restoration establishment created to preserve everything from ancient manuscripts to priceless books to historic documents? 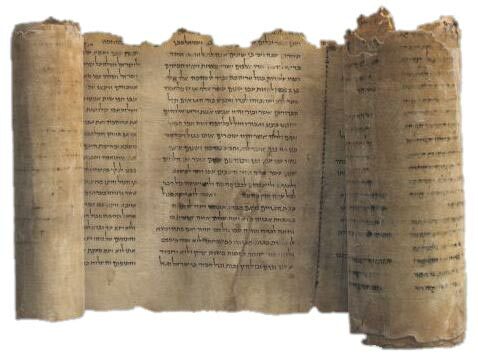 They donated their own blood to carry out experiments after learning that an ink with human blood had been used to write the Dead Sea Scrolls – apparently because its iron content helped stabilize colors, according to Agence France-Presse. The institute has been a cutting-edge entity since it was founded in 1938 to preserve Italy’s priceless archives. “The museum is filled with books suffering from the worst kinds of ailments – including one with a hole as big as a fist eaten by termites or another riddled with bullet holes from the Battle of Monte Cassino during World War II,” according to the wire service. The institute is the main point of reference for book and archive restoration in Italy but also does work for the Vatican and internationally, it added. And its work has expanded greatly over the past seven decades from simply restoring Italian archives. In a bid to ensure the preservation of priceless frescoes by such artistic greats as Michelangelo, Botticelli, Ghirlandaio and Perugino, the famed Sistine Chapel has been fitted with detectors to check for pollution. Millions of visitors annually view the chapel, built in the late 15th century by order of Pope Sixtus IV. Vatican Museums director Antonio Paolucci explained in the Holy See’s official daily, Osservatore Romano, on Thursday that the initiative was enacted in order to update the building’s air conditioning and ventilating system. The detectors, put in place this summer, measure temperature, humidity, chemicals as well as currents of air, Paolucci said. “It was necessary to understand the dynamics of the pollution,” he said. Thirty-six of the detectors are suspended and 14 others are fitted in other parts of the chapel, which is covered in paintings on the walls and ceiling.